This is, without a doubt, the most exciting time to be involved with building and improving affordable places that Memphis and Shelby County residents can call home! 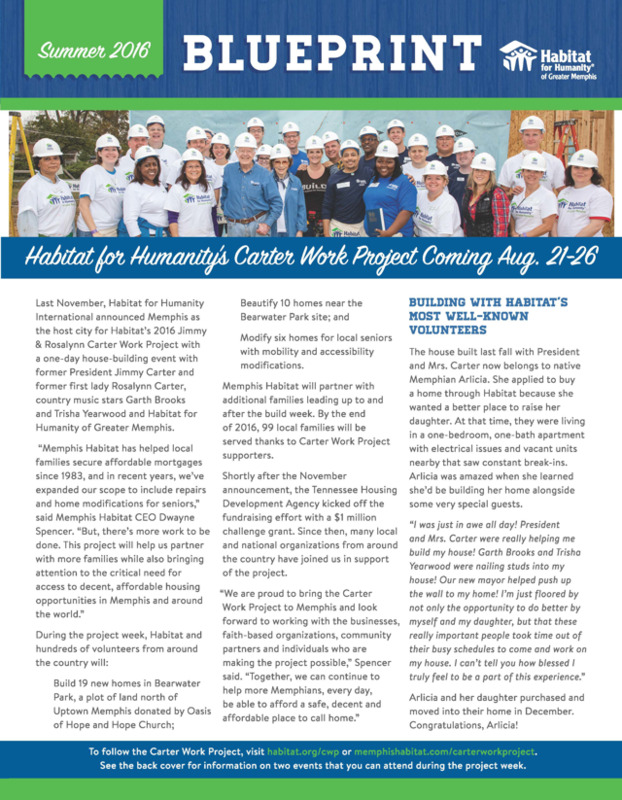 Habitat’s Jimmy & Rosalynn Carter Work Project will showcase not just Memphis Habitat, but also our city and the massive effort that is underway to bring life back to various areas of town that were previously forgotten. By the end of 2016, 99 families will have new or improved places to call home because of this incredible project. Our Aging in Place Program is now serving an important need in the community and is also a part of the Carter Work Project. Habitat for Humanity International highlighted our program in Habitat, its monthly magazine, and we are excited to share that story with you in this issue. You’ll also meet homeowners who recently bought their first homes with Habitat’s affordable mortgages. August marks my 15th anniversary with Habitat for Humanity of Greater Memphis, and every day I’m humbled by the work we do and the impact we have on our community. This work all happens because of you and your support to make sure everyone, every day, can afford a decent and affordable place to live. Thank you for believing in and continuing to support our mission.